The flannel suit is something not often found off the rack in stores today. Most people are looking for lightweight suits and flannel is usually a heavier fabric (it’s not very robust in lighter weights). Flannel is also much too warm to wear in today’s over-heated offices, not only because of it’s heavy weight but because it has a thick nap that keeps in body heat. 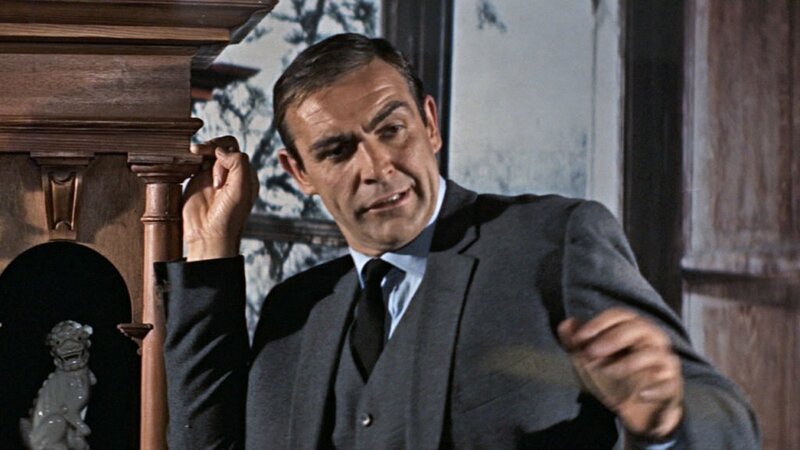 James Bond wears this dark grey flannel three-piece suit made by Anthony Sinclair to a funeral in Thunderball. The scene takes place in France, and we can assume it’s fairly cold weather from the fact that Bond is carrying with him a hat and topcoat. 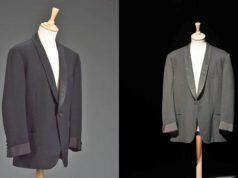 The jacket is Sean Connery’s usual button two with narrow lapels, this time with no vents and jetted pockets. The cuffs, as usual, close with four buttons. The trousers have the typical double forward-pleated front with Daks tops. The bottoms are finished with turn-ups like in the first two Bond films. The waistcoat here is something different. It has six buttons, all of which close, and the bottom is cut straight across. It almost resembles a cardigan. The Turnbull & Asser shirt is mid blue with a spread collar, a narrow front placket and cocktail cuffs. The tie is a black grenadine, the perfect funeral tie and most appropriate for this scene. Bond’s shoes are a black short boot that we will cover in more detail tomorrow. You may notice a continuity error when Bond puts on the jet pack: his cocktail cuffs become double cuffs, and when he lands he is wearing cocktail cuffs again. Will there be any discussion re Bond's choice of hairpieces? They seem to get worse as the films progress, by the time Diamonds Are Forever rolls around its painfully obvious. Just joking. I love the blog. Very informative. I actually thought the Diamonds Are Forever hairpiece was a big improvement over Thunderball and You Only Live Twice. Hmmm, are we counting that horrible wig he wore as part of his "Japanese" disguise?? No, I wasn't even counting that wig. The normal hairpiece in that movie was bad enough. People can say what they want about Pierce Brosnan, but the man had a great head of hair! The IMDB trivia page for Dr. No has a tidbit that claims that Connery wore a hairpiece from the get-go. I don't know. There's a scene where he comes up out of the water with his hair splayed on his head that looks pretty real to me: his hair looks thinning. If they were trying to cover his baldness, why let it look like he's balding? Overall, any coverage over his thin spots looks to be creative hairstyling. By the time From Russia With Love came along, I can imagine he lost more and they may have added stuff for coverage. Then with Goldfinger, the hairline "help" seems a lot more obvious. If I recall correctly, I read/heard somewhere that the hairpiece change in Thunderball was to reflect the fact that Connery was going to have to do a lot of water work, so they had to go with something minimal. And I think that with something minimal, the up-do that he had in the previous films would be off the table. So there was more of a flat, combover thing going on, similar to what you see in that photo where Sinclair is fitting him for a suit, and probably more like what Connery's hair was like in real life. 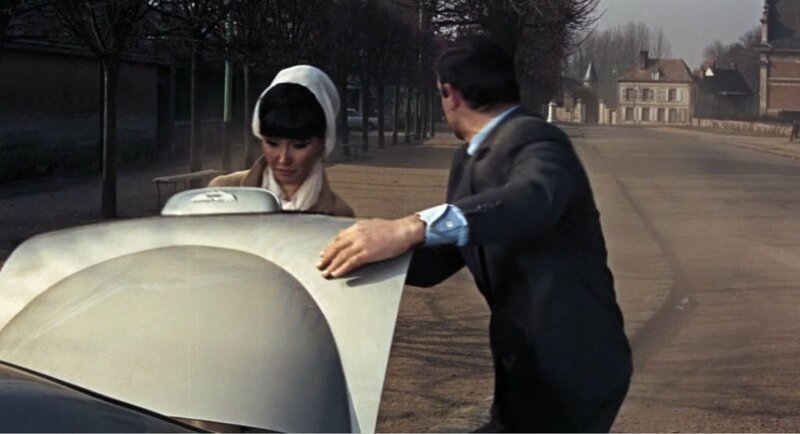 And that approach probably continued into You Only Live Twice. By the time Diamonds Are Forever came along, he was back to the up-do, which, obviously, was a full blown toupee. And that's probably the most I've ever discussed James Bond's hair in my life. No wait — that's *definitely* the most I've ever discussed James Bond's hair in my life. The photo of Sinclair and Connery is from 1963 because that suit is the silk suit worn in From Russia With Love. That's of course Connery's real hair which proves he wore a piece in FRWL. And since it was only a year after DN, did he lose that much hair? Perhaps it was his real hair in DN but just styled better. It's clearly a hairpiece by Goldfinger, and some FRWL promo shots had a similar toupee. the waistcoat is interesting, have never seen one like that before!!! well done!!! AFAIK, that waistcoat style was popular on and off for a while, with its last appearance in the 1960s. Steve McQueen wore a similar one in "The Thomas Crown Affair." I'd love one like it, but am afraid it might look a little too quaint or dated. I have read that it was a toupee from the very first film, and apparently Sean Connery even said so himself in that infamous Barbara Walters interview, the one where he mentioned giving hysterical women a slap to calm them down. I can't find the full interview, as people are only uploading that bit! As for the info, thanks for sharing that guys. I was wondering why he had a really flat-looking toupee in Thunderball. I prefer the up-do. I am not sure why it should be to do with the water scenes – in Thunderball Sean does not wear a toupee underwater – that's his real hair, which seems to be sadly thinning. I believe that his real hair is shown in the scene where he pretends his boat is broken down to get a ride with Domino – it looks shorter than the toupee and similar to the Sinclair photo, which I think was harshly lit. It also seems to be his real hair in the cave diving scene in You Only Live Twice. As baldness is really not usually so aggressive it seems logical to assume that he could not have lost that much hair in the year between Dr No and From Russia With Love (as seen in the Sinclair photo) My guess is that hair from his natural hairline (which was still there) was swept back and blended into a toupee for the up do style, and that as it advanced, they opted for less natural-looking lace front wigs from Goldfinger onwards. Strangely, his best toupee seems to be at the start (pre-title sequence) of Goldfinder, which is then replaced with a flatter, less natural-looking one. The best that I have seen Seanie looking is in Alfred Hitchcock's Marnie (1964 – the same year as Goldfinger) It is refreshing to see him in his physical prime doing a different role outside of Bond. His toupee in Marnie is superb – a very strong-looking up-do and very neat and natural. He even gets it wet in one scene and it looks perfect. So it is possible to have an up-do type toupee, wet. (Marnie scene: http://www.youtube.com/watch?v=C6WgtIXtlek) I wonder if the Marnie toupee was used at the start of Goldfinger before being replaced. 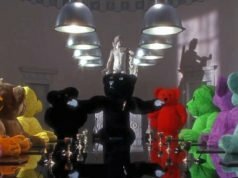 While sometimes the pre-title sequence is filmed after the rest of the film is shot, from what I have read this scene was the opening shoot. 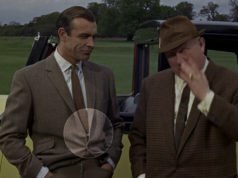 The suit in Goldfinger does not have trouser turn-ups like this suit. The colour of that suit also has a hint of blue, whereas the suit in Thundball is straight grey. I am having a suit made ton match this 3 piece grey flannel suit but I need to know how many weleded pocket does the waistcoat on this suit have. It looks like either 3 (2 lower and 1 on the left breast) or 4 (2 lower and 2 upper) but I could be wrong since I do not have a Blu-ray player. What do you make of this Matt? 0, 2, 3 or 4 pockets? This waistcoat has the standard 4 welt pockets. don’t worry, this is my last post of the day… lol. Now, the question… thinking about flannel suits, I remenbered that there’s one suit in From Russia with love that really looks like a flannel one : it is the one we see when Bond is in the Gipsy camp and also when he let Kerim Bey kill Krilenku. 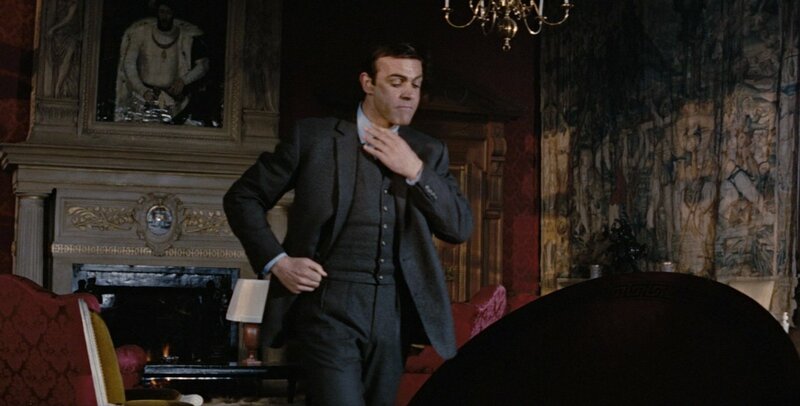 It looks like a dark grey flannel, but when we see Bond entering into the camp and leaving it, both in a car, he seems to be wearing that dupioni silk suit you wrote me about. Is this the same suit ? I know that this thread is several years old, but I had to add a comment on the Sean Connery toupee subject, for what it’s worth. During the mid-late 1970’s, I used to get my hair cut at a barbershop called London Crimpers, near the University of Cincinnati (Ohio) campus. The owner of the shop, an English gentleman, told me he had been an apprentice to the female hairdresser on the set of “Goldfinger.” He described what he called a “plug” as the partial toupee they used on Sean Connery, basically a small piece that was cemented to Connery’s forehead at the hairline, which his real hair was then combed over. I remember asking the man what he thought of Connery, and he responded in the positive, saying “Oh, he was a real mate,” and that Connery was very friendly with the crew of the film. I was wondering what you thought of Fox Brothers’ 290g flannels. Do you think they would be robust enough for suits that will get only occasional wear? For occasional wear, it should be okay. You would definitely want to get a second pair of trousers for a suit made of such a lightweight flannel. I’d recommend a heavier flannel, such as the 370g weight. Would the Fox Brothers 530g charcoal flannel be a close match to this one? I imagine the trousers would hold up very well? I’m finding 370g to not be particularly robust in terms of the trousers (jacket holds up fine however). I suspect it would be a close match. But be aware that such a weight will feel like a light topcoat unless you are used to vintage suits. I don’t think that Connery’s flannel would have been this heavy. Ah I see, that’s an excellent point. Will likely get a suit in both the 370g & the heavier 530g eventually but the 370g charcoal will be first and likely a close match too. I have a bee in my bonnet about how over-heated offices are nowadays. It makes even a lightweight two-piece suit difficult to wear. At a stretch, it may be due to the age’s laid-back dress style. I disapprove; it is terrible for the environment, and while the too-cold can wear more layers, the too-warm can do nothing! Connery’s eyebrows must have seen some grooming. The bushier eyebrows were in fashion in the 1970s, just as sideburns, moustaches and chest hair were in.